A Holistically developed and peaceful Diocese with fullness of life! The Diocese of Pekhon, where the evangelization works started by PIME Missionaries in the late 19th century, initially belonged to the Archdiocese of Taunggyi. As the mission territory was far distant and the number of believers was considerably increasing, it was established a Diocese by His Holiness, Pope Benedict XVI, on December 15, 2005, as a Suffragan of the Archdiocese of Taunggyi. It was inaugurated by His Grace Msgr. Salvatore Pennacchio, the Apostolic Delegate to the Union of Myanmar, on April 1, 2006. Msgr. 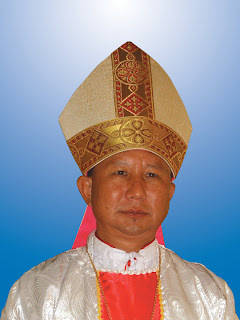 Peter Hla, who was consecrated the Auxiliary Bishop of Taunggyi in 2001, was installed as its first Ordinary on the same day. townships in the Diocese and they are Pekhon, Pinlaung, Naungtaya, Hsi Hseng and Maukmai. Pekhon Diocese overs an area of about 10,150 square miles, and is mostly hilly and mountainous. It has borders with Taunggyi Diocese in the East and in the North, Mandalay Diocese in the West, Loikaw Diocese in the South and Taunggyi Diocese in the South West. The approximate population in Pekhon Diocese is about 253,000. Buddism is the predominant religion whereas Christianity, animism and a few other religions are minority. There are many ethnic minorities in Pekhon Diocese: Shan, Pa-Oh, Intha, Kayan, Kayah, Lisu and so on.